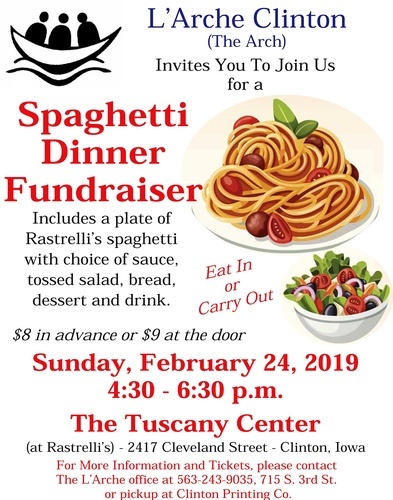 L'Arche Clinton invites you to join us for a Spaghetti Dinner Fundraiser. Includes a plate of Rastrelli's spaghetti with a choice of sauce, tossed salad, bread, dessert & drink. For more information and tickets, please contact The L'Arche office at 563-243-9035, 715 South 3rd Street or pickup at Clinton Printing Co.